The Central City Opera House was built in 1878 by Welsh and Cornish miners. 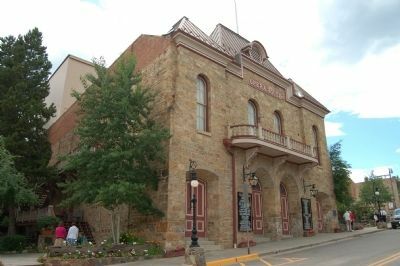 This National Historic Landmark, centerpiece of the historic gold mining town of Central City, has hosted performances of the nation’s fifth-oldest opera company since 1932. Central City Opera’s National Summer Festival attracts patrons from all over the country and abroad to enjoy intimate opera in its 550 seat opera house. Her early glory years following the 1878 grand opening were short-lived. When the Central City mines were played out, the Opera House fell into disrepair. Fortunately, a volunteer-driven effort lead by Ida Kruse McFarlane, Edna Chappel and Anne Evens led to an extensive restoration of the Opera House in 1932. That summer, the legendary actress Lillian Gish opened the newly restored Opera House with Camille, launching an annual tradition of summer festivals in Central City that continues to this day. Today, the Central City Opera ranks as the nation’s fifth-oldest opera company. The intersection of Main, Spring and Nevada Streets. The marker is located behind the spot signs. Helen Hays, Samual Ramey and Catherine Malfitano. Successful commissions by the company include the American classic The Ballad of Baby Doe by Douglas Moore, which premiered in 1956; the popular one-act opera The Face on the Ballroom Floor by Henry Mollicone, premiered in 1978; and the 2003 world premiere of Gabriel’s Daughter, also composed by Henry Mallicone. Directed by John Moriarty for many years, Central City’s prestigious Bonfils-Stanton Foundation Artists Training Program gained national recognition. Moriarty is now Central City’s Artistic Director Emeritus. As many a visitor has been blessed to witness since 1878, the glorious history of the Central City Opera House lives on with exciting new productions each summer. Erected by The Gold Belt Tour. Location. 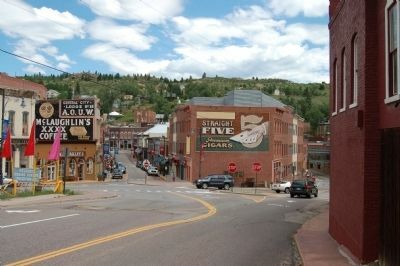 39° 47.971′ N, 105° 30.751′ W. Marker is in Central City, Colorado, in Gilpin County. Marker is at the intersection of Main Street (State Highway 279) and Spring Street on Main Street. Touch for map. Marker is in this post office area: Central City CO 80427, United States of America. Touch for directions. 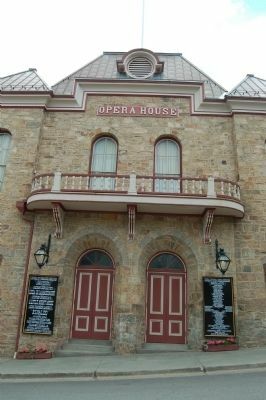 The Opera House is located at 200 Eureka Street. (within shouting distance of this marker); The Rose Haydee Building (within shouting distance of this marker); Washington Hall (about 600 feet away, measured in a direct line); Train Trestle (approx. 0.9 miles away); Bird’s-eye view of Black Hawk (approx. one mile away); Fick’s Carriage Shop (approx. one mile away). Touch for a list and map of all markers in Central City. More about this marker. 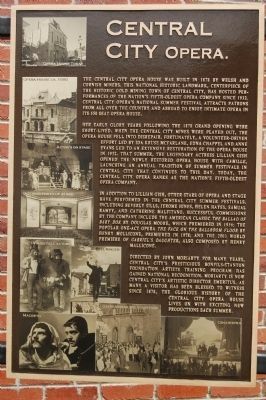 The Central City Opera marker is located under the Straight 5 Premium Cigars advertising painting on the side of the building at the intersection of Main, Spring, Nevada and Roworth Streets. The Opera House is located at 200 Eureka Street. More. Search the internet for Central City Opera. Credits. This page was last revised on June 16, 2016. This page originally submitted on January 21, 2012, by Barry Swackhamer of San Jose, California. This page has been viewed 684 times since then and 5 times this year. Photos: 1, 2, 3, 4. submitted on January 21, 2012, by Barry Swackhamer of San Jose, California. • Syd Whittle was the editor who published this page.